A couple of weeks ago, I saw the movie Bully, a documentary by Lee Hirsh. It presents a heartbreaking look at bullying and got me thinking about all kinds of things, including my own childhood. I get why people want children (I do too), and even why people want to work with children, but I don’t understand the romanticized view of children and childhood that many people seem to have. Of all the people in my life who have treated me badly, the vast majority where other children, while I was a child myself. I’ve never had to deal with anything nearly as bad as that depicted in Bully, but I honestly would never want to relive my childhood. I learned early on that being “me” was, for some reason, not okay. The joy of adulthood has been to realize that the very same personal traits that were deemed uncool when I was younger, are now the same traits people like about me. Life has a way of working out in the end, I suppose. So, what does this have to do with Daredevil? Well, it got me thinking about him too. I would argue that there are three obvious traumas behind Matt’s becoming Daredevil, and they are central to the Daredevil mythos. The one that is referenced most often is probably the loss of his father. 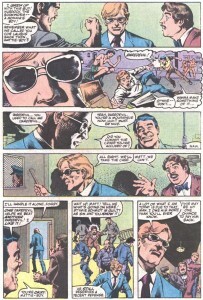 Jack Murdock’s murder, and the legal injustice that followed it, was the final trigger (no pun intended) which caused Matt to start working on both sides of the law. 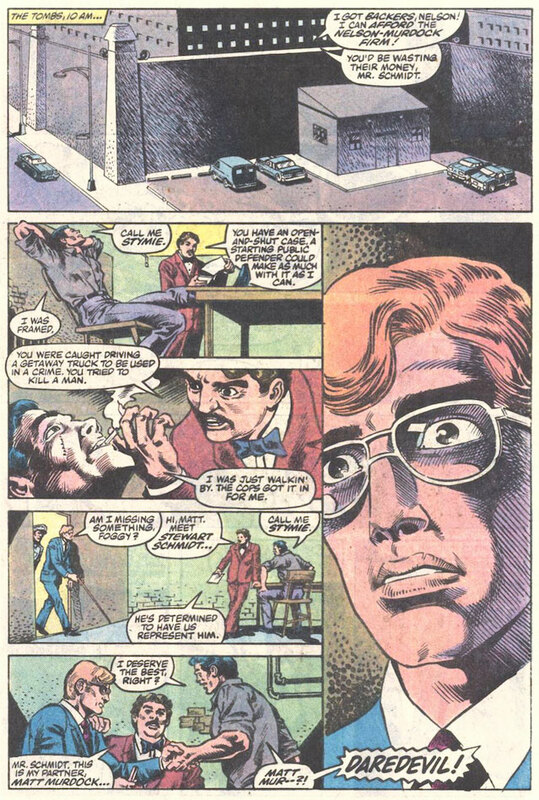 Another key components is, of course, the accident that blinded him. It not only gave him his heightened senses, but strengthened his resolve to do something important with his life. And then, there’s the bullying. While it’s not a facet that’s touched on quite as often as Matt’s relationship with his father or the consequences – good and bad – of his altered physiology, it is an important part of the character and what makes him tick. 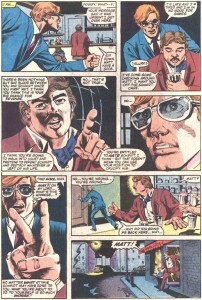 It even inspired the name Daredevil, first given to him as a sarcastic label to describe everything young Matt wasn’t. Making that name his own is an act of defiance, a big and loud “up yours” directed at everyone who thought less of him. Matt’s status as an adult survivor of childhood bullying is one of the many things that make him relatable and I suspect that it appeals to a lot of fans. As it turns out, this is only the beginning of Matt’s odd behavior and Foggy soon becomes suspicious of Matt’s way of handling the case. So, which are the facts Foggy is rushing to verify? 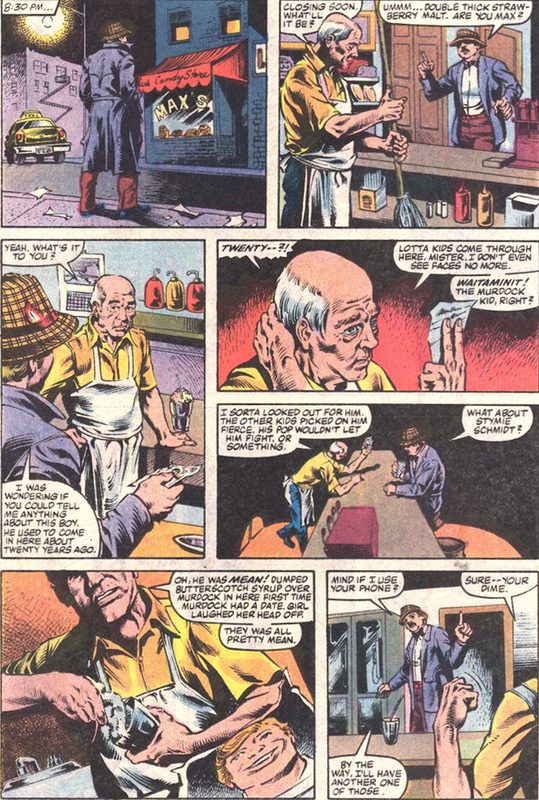 Well, the issue is a little weak on the details, but next time we see Foggy, he has ended up in Matt’s old neighborhood, talking to the owner of a local shop about the kids that used to come by. 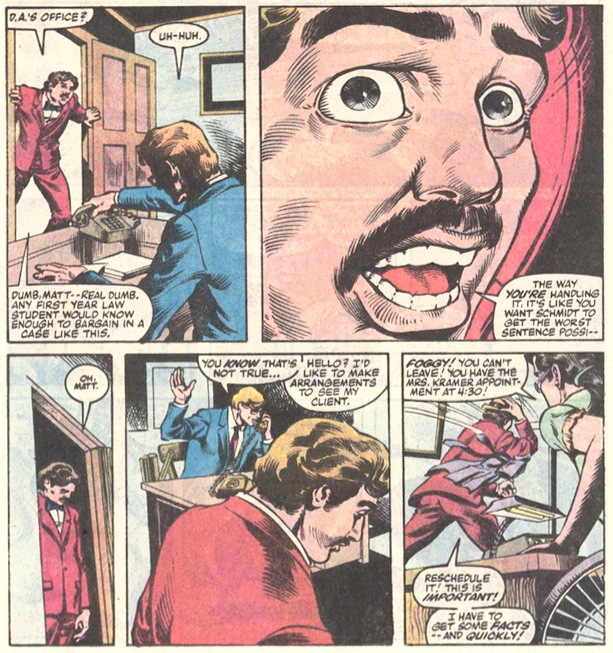 He shows him a picture of Matt and one of Stymie (see the page below on the left), and soon, Foggy has the answer to Matt’s irresponsible lawyering. 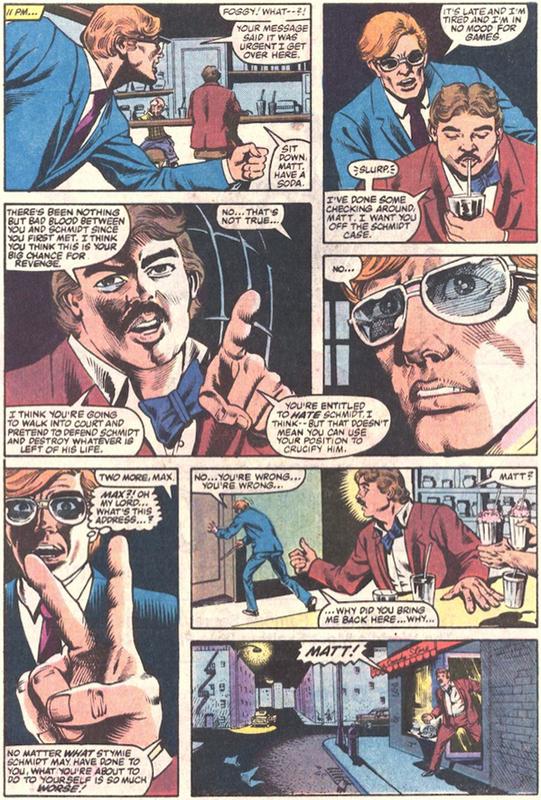 To confront his friend, he calls Matt and asks him to come. Coming back to the old neighborhood, has a profound impact on Matt (see pages above) who suddenly realizes that his recent behavior has been inspired by nothing more than petty vengeance. We also see him fully express, in a way that’s rare, just how much the torment that he had to endure as a child still haunts him. This scene may be lacking in subtlety, and it’s hard to accept the extent of Matt’s denial, but it’s still an interesting take on a favorite character. 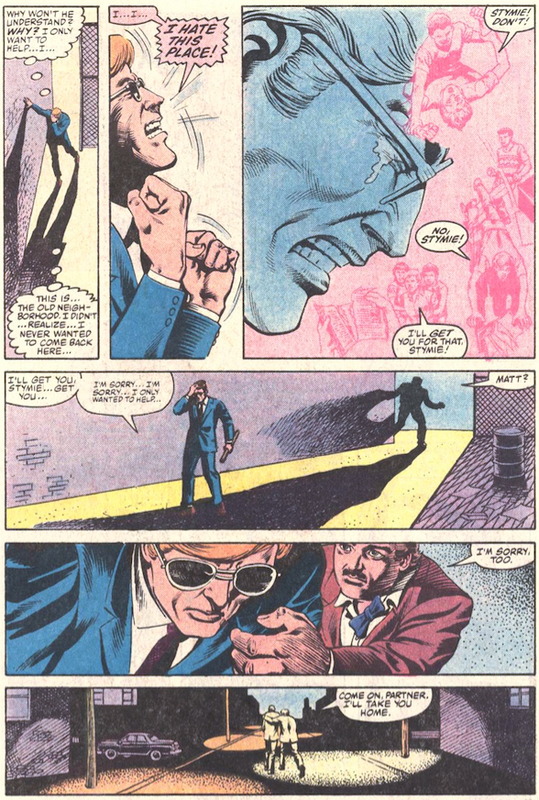 When I was a kid, Daredevil’s blindness was the main draw for me–my own eyesight was getting rapidly worse–but I’d be lying if I said his experiences with bullying didn’t play a big part too. 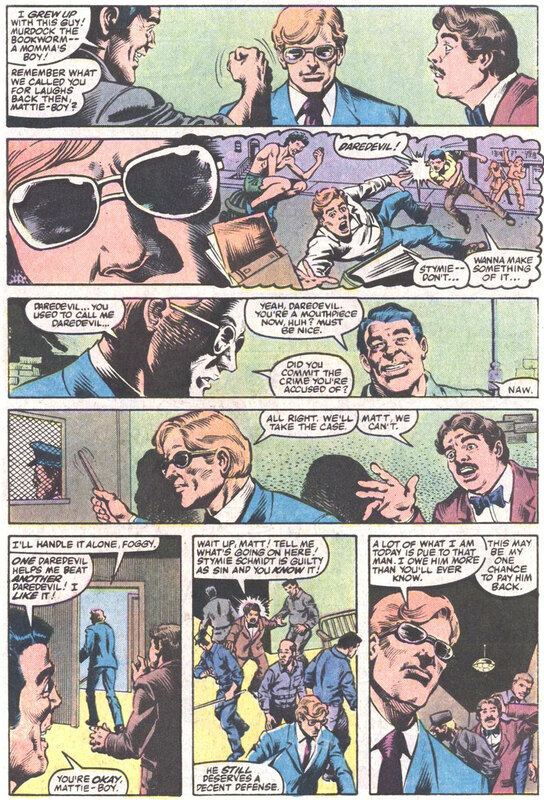 As a bookish kid in a culture that prized ignorance, as a lower-middle-class kid in a pricey private school, and as a tomboy girl in a class full of would-be debutantes, I identified strongly with young Matt Murdock getting taunted and smacked around for being different, and still turning himself into not just a hero, but the embodiment of everything his tormentors said he couldn’t be. And doing all this while blindfolded? Take THAT, yard apes! Good article, Christine. 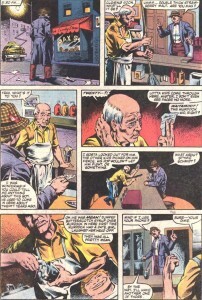 I’ve loved that story in DD #203 for years; along with Alan Brennert’s story in #192, probably the best DD story between the Miller and Nocenti runs. 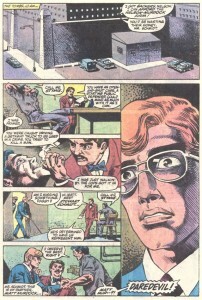 What makes them special is that they focus on characterization and psychology, instead of punching out super-villains. Glad to see Steven Grant’s story finally getting some attention.